Shown here is dilation of bowel (megacolon) proximal to the affected region of narrowing at the lower left center in sigmoid colon. Mucosal damage and secondary infection may follow. Hirschsprung disease results from an absence of ganglion cells in both submucosal and myenteric plexuses and can occur in either a segment of colon (short segment disease) or the entire colon (long segment disease). The aganglionic segment becomes narrowed, causing obstruction, with proximal dilation. Affected newborns may develop focal inflammation at the point of obstruction, with fever and diarrhea. Colonic perforation may occur. Infants with the disease may have alternating diarrhea and constipation, while children mainly have constipation. Treatment consists of surgical correction with resection of the aganglionic segment. 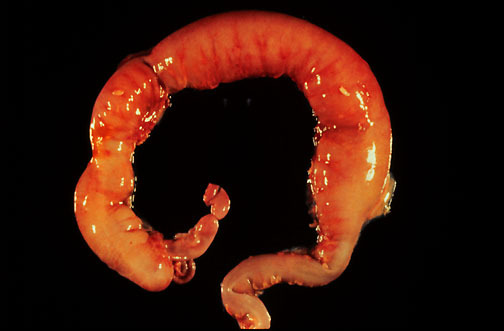 Hirschsprung disease is thought to result from mutation of susceptible genes interacting with environmental and other factors, resulting in variable penetrance. Multiple genetic mutations have been found, but about half of familial cases and 15% of sporadic cases are associated with RET gene mutations that inactivate RET receptor kinase activity. RET promotes survival and growth of neurites and provides direction to migrating neural crest cells. The incidence of Hirschsprung disease is 1 in 5000 livebirths. It has a 4:1 male to female predominance. Short segment disease is more common in males, while the rarer long segment disease predominates in females.